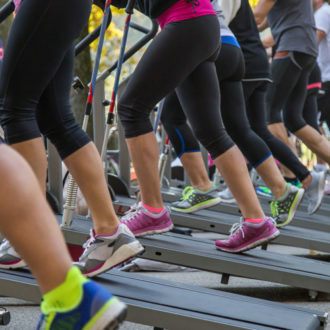 Personal trainer, Laura Williams believes that walking for weight loss is one of the easiest ways to burn excess kilojoules, tone up and slim down. Plus, it’s so simple to commit to, no fancy equipment or gym memberships, you simply lace up and off you go! Use these 5 top walking tips to help you loose weight and get healthy. Gone are the days when walking was considered to be running’s poor relation. Referred to as the “superfood of fitness”, walking for weight loss is now thought to be a fast track to improved health, fitness and energy. Walking regularly has been proven to reduce the risk of heart disease and stroke by lowering the levels of ‘bad’ cholesterol and increasing ‘good’ cholesterol levels. And, according to the American Stroke Association, just 30 minutes of brisk walking a day can help to prevent and control high blood pressure. When you walk faster or walk uphill, this provides a workout for both heart and lungs, too. Walking doesn’t just tone the lower body, it works the upper body muscles as well. Walking for weight loss is simple because it’s a great kilojoule burner too. It helps to shift fat from all over the body. At a brisk rate, you’ll burn up to 500 kilojoules every 1,5km. It’s definitely anti-ageing, too – a study at the University of California found that age-related memory decline was lower in women over 65 who walked just over 3km a day, compared with those who walked just under 1km a week. Make sure you look forward, keeping your chin parallel to the ground. Straighten your spine. Don’t tilt forward, arch your back, or hunch your shoulders. You can gently tense abdominal muscles (don’t hold your breath) while you’re walking to help you maintain good posture. Maintain a bend in the elbow and, if you’re trying to speed up, try swinging arms at a faster pace with a 90-degree bend in the elbow. Vigorous arm swinging will also increase your kilojoule expenditure. This can cause injury. If you want to speed up, try taking smaller, faster steps. Always warm up and cool down. Increasing body temperature and blood flow to the muscles is a good way to prevent injury and warm your body up for exercise. There’s no better walking-workout warm-up than a short walk! Walk for a few minutes before stretching out thighs and calves, and rotating ankles and shoulders to improve mobility. 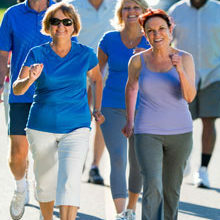 Walk for a bit longer at a moderate pace to warm up for faster walking and walking uphill. 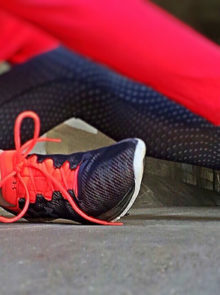 Then stop and, without cooling down too much, stretch out calves and thighs. If you’re following Laura’s six-week walking plan, you’ll naturally start feeling fitter and stronger. However, if you’re time-poor and struggle to increase the duration of your weekday walks, make them more frequent instead. For longer walks, continue to add to your kilometres, but ensure your increases are consistent – add an extra 1 to 1,5km. On longer walks, try to keep the pace steady. 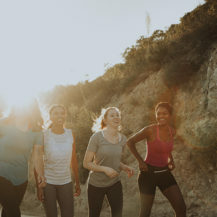 Aim for your moderate pace for the majority of the walk but, depending on energy levels, don’t be afraid to intersperse a slower pace with your moderate one. We haven’t included hills in the weekly routine, as not everyone has access to hilly terrain, but feel free to add hills to your weekend walk and/or replace the fast, power-walking sections during the week with walking uphill at a moderate pace. Hills are really great for adding a challenge to your walking workout – they’ll boost your fitness levels, burn even more kilojoules, and they’ll work the backs of thighs and bottom muscles that little bit more.